In this article, we’ll give you a brief introduction to robot programming and how you can use Visual Components to streamline OLP. We’ll discuss some of the key features that make this possible, and show you an example of how they work. Offline programming (OLP) software has come a long way over the years. What was once viewed as a technology that was too expensive and complex for most manufacturers is now more advanced, more affordable, and much easier to use. OLP software provides a meaningful return on investment for many types of automation projects, by saving time, improving productivity, and helping manufacturers to identify opportunities for cost savings. Robot programming is the process of programming a robot to perform a set of tasks. For industrial robots, programming can be done “online”, meaning in a production environment, or “offline”, meaning outside a production environment. Two of the key methods for robot programming are robot teaching and offline programming. The OLP method uses 3D data to create a virtual model of the robot and work cell. Using simulation, it allows the user to virtually teach the robot. Because OLP is a computer-based approach that uses digital models and advanced simulation, it’s much faster and more accurate compared to online programming for many applications. Some software products used for OLP, like Visual Components, have features that also make the OLP process very simple. OLP software provides a meaningful return on investment for many types of automation projects, by saving time, improving productivity, and helping manufacturers to identify opportunities for cost savings. With Visual Components Premium, you can create programs that define the actions and routines to be performed by an industrial robot. This can be done by virtually teaching the robot positions, or by using the curve-teaching tool to generate paths. You’ll probably use a combination of these methods in developing your robot program. A new feature we introduced in Visual Components 4.0 is the curve-teaching tool, which greatly simplifies robot path teaching. In this section, we’ll introduce you to the curve-teaching tool and how you can use it to teach a robot a path of positions. A Path statement in Visual Components describes a sequence of positions for a robot to follow to complete a given path. Depending on the application, such as deburring, sealing or arc welding, a robot program may have tens or even hundreds of positions that need to be defined. As you might imagine, creating a robot program for one of these applications can take a lot of time, especially if you have to teach all of the positions. The curve-teaching tool simplifies this by automating the robot path teaching process. It analyzes object geometries, makes path predictions, and suggests robot paths. It then automatically generates the statements in your robot program code. The key to this is virtual topology, which is a kind of feature recognition in Visual Components 4.0. 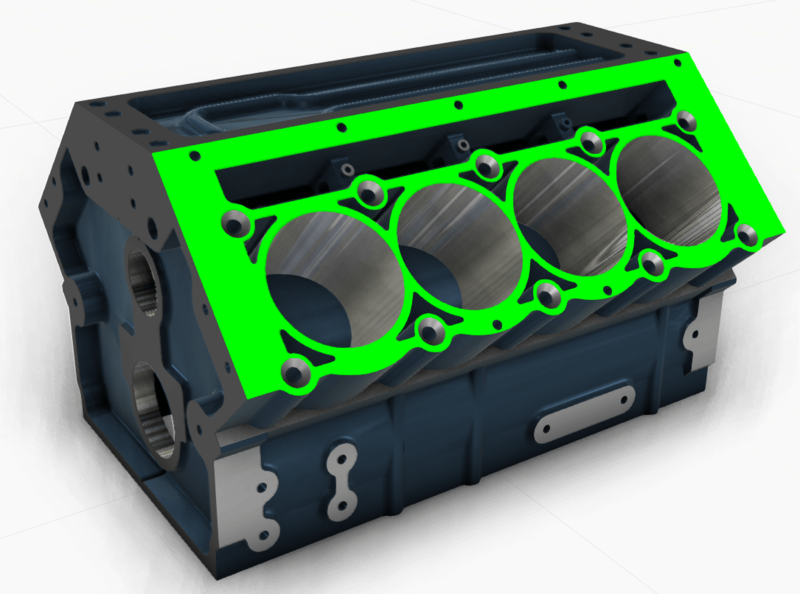 When a CAD model is imported into Visual Components, our 3D geometry engine analyzes the model and provides structured data of the geometry’s surfaces, curves, and curve loops. The curve-teaching tool uses this data to make its path predictions and suggest robot paths. The virtual topology feature can also be accessed as a service through our topology API, and used to develop custom robot path planning and teaching tools. This is especially useful for users who want to create their own path generation tools for their organization’s customized manufacturing processes. 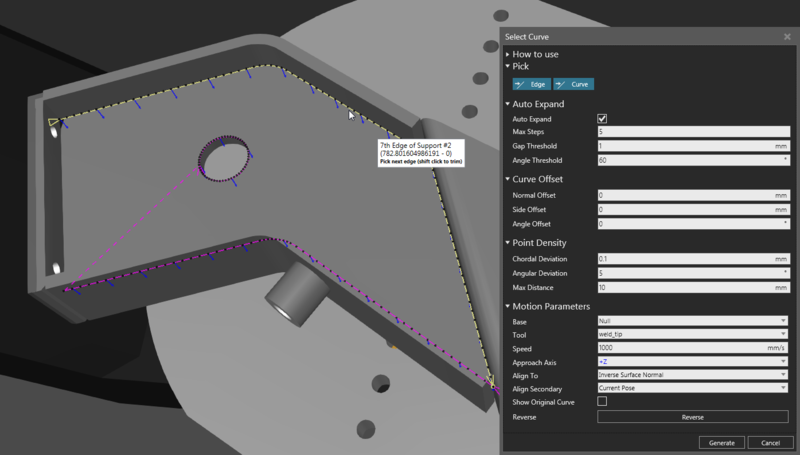 Visual Components Premium includes advanced features and capabilities for OLP, making it a fast, easy, and economic solution for robot programming and planning new work cells. 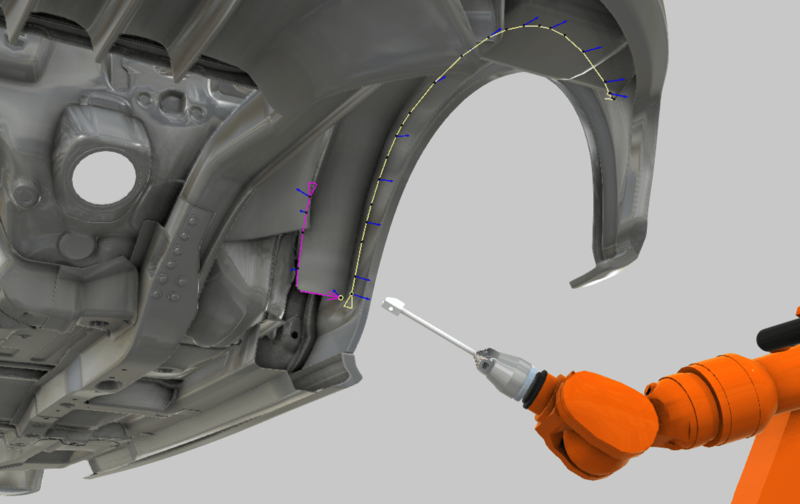 Features like the virtual topology API and curve-teaching tool help to simplify and accelerate robot path teaching. The open architecture of Visual Components 4.0 makes it a very customizable and powerful platform on which to develop OLP solutions. The Visual Components platform is used to power OLP tools used in many areas of manufacturing. Checkout the products developed by our OLP partners, Delfoi and Octopuz. If you want to find out how you can use Visual Components to design and validate a robot work cell you’re planning, get in touch with us to schedule a personalized web demonstration. 1) Pan, Z., Polden, J., Larkin, N., van Duin, S. & Norrish, J. (2012). Recent progress on programming methods for industrial robots. Robotics and Computer Integrated Manufacturing, 28 (2), 87-94. Delfoi took welding simulation to a whole new level with Visual Components software. Virtualize your factory with Visual Components Premium, our complete manufacturing simulation solution. 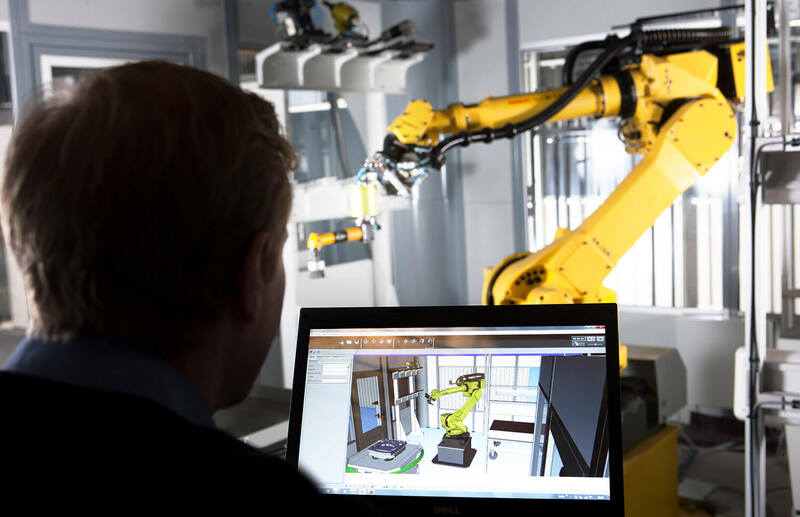 Find out how In-House Solutions gained flexibility in application development and extensive time savings in off-line programming with 3D simulation.